For the cause they knew was right. A cheering word, as they marched away. What did he more than the other had done? In the district of Bogan Gate. Deserves the best you can do or say. Cornelius Michael Walsh and Susan Emily O’Meara were married in Wagga Wagga in August 1880. A son, James, was born the following year, followed by a daughter, Mary in 1883. A second son, Joseph Albert Walsh was born in Orange is 1894, followed by three more daughters. Cornelius was well-known in Orange, being a veterinary surgeon and a breeder of trotting horses. Joseph was educated by the Patrician Brothers in Orange, under whom he passed the Public Service Examination. He proceeded to join the Orange Land Board Office as a deposition clerk. Joseph also served four years with the Orange Troop Militia Light Horse, gaining a Certificate for Commission from Duntroon Military College. In November 1915 the Land Board Office granted Joseph military leave to serve in the First World War. By the time Joseph enlisted he was the only remaining son in his family; James had died in 1898, as had his youngest sister, Gertrude in 1901. Joseph was assigned initially to the 1st Australian Light Horse. In September 1916 he was transferred to the 29th Battalion, 11th Reinforcements. He embarked A19 Afric in Sydney on 3 in November 1916, arriving in Plymouth on 9 January 1917. Private Walsh undertook further training at Hurdcott camp and proceeded to France in March. On 7 April 1917 he was Promoted to Lance Corporal, and, a month later, to Corporal. During the last two weeks of July 1917 Corporal Walsh attended Musketry School in the field; he was promoted to Sergeant on 6 August. On 27 September 1917 the 29th Battalion was engaged in the Battle of Polygon Wood. It was here that the 23 year old Sergeant Walsh was killed in action. According to a fellow soldier he received a gunshot wound to the leg followed by a fatal shot to the head. Joseph was buried in the Hooge Crater Cemetery at Ypres. Nothing can give us greater ease and trust than frequent Holy Communion. Whenever I get an opportunity I go, and take the boys of my platoon. The line has no terrors for us, fortified as we are by God’s grace in Holy Communion. 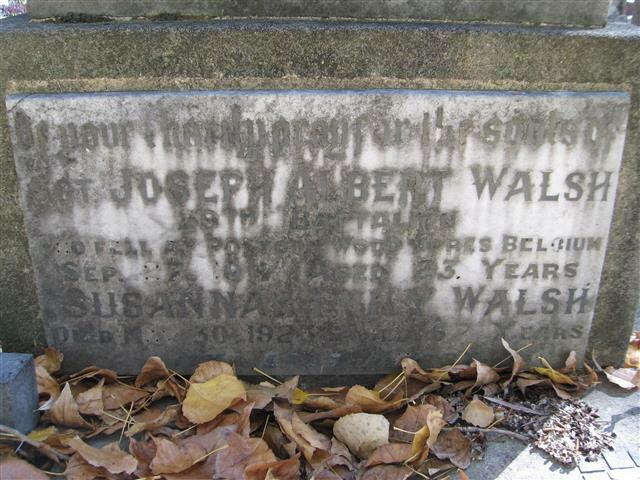 I am in receipt of a communication from the Defence Dept informing me of the death in action of my only Son, No 4387, Sert JA Walsh, B Company, 29th Battalion, AIF Between 26 and 27 Sept.
…Can you send me the address of the Catholic Chaplain of the 29th Battalion? I am most anxious to know if my beloved son received burial. I am anxious to receive his personal belongings and his uniform if possible. Can you procure there for me if possible or advise me of what steps to take to secure them. I would also derive some consolation from hearing of the manner of my dear boy’s death. I have to state that in due course any personal effects that may be recovered relating to your son…will be forwarded to this Office for transmission to you, or in accordance with any testamentary instructions that may come to hand. His uniform and military equipment will not be returned. It was not until October 1918 that Cornelius received his son’s personal effects: two wallets, a razor, a silver wrist watch, photos, cards, letters, certificates. Joseph’s identity disc followed in June 1920, his war medals in April 1921, and his memorial plaque in September 1922. In 1923 the Anzac Memorial Avenue of trees was planted along Bathurst Road to commemorate fallen WWI soldiers. A tree was planted in honour of “Sgt JA Walsh”; it was donated by CR Campbell. Very few of the trees are still standing today. Joseph Albert Walsh is commemorated on the Patrician Brothers’ Roll of Honour, St Joseph’s Church Orange Honour Roll, the World War I Roll of Honour on the southern face of the Orange Cenotaph and on panel number 116 on the Roll of Honour at the Australian War Memorial in Canberra. He is also remembered on a commemorative plaque on his mother’s grave in Orange Cemetery, Catholic Section TG – 93/94. Joseph Albert Walsh commemorative plaque, Orange Cemetery. Image courtesy Orange Cemetery. Senator Edward Davis Millen is appointed Australia’s first Minister for Repatriation. The Repatriation Committee would come to encompass healthcare, compensation, soldier settlement, and vocational training to help returned men find work. Robert Clyde Jones was born in Forbes in 1895. His father was Richard Edward Jones of Tamworth and his mother Alice Maud Peters of Summerhill Creek. Richard and Alice were married in Orange in 1889 and had several children. Robert was educated at Orange East Public School. 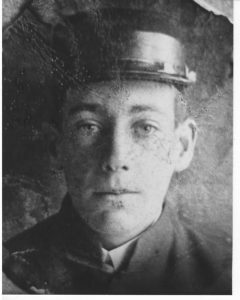 Robert embarked from Sydney on 14 April 1916, a private in the 4th Battalion, 17th Reinforcement, D company. He arrived at Suez on 17 May and was reallotted to the 14th Training Battalion at Tel-el-Kebir. On 21 June he embarked HT Invernia at Alexandria to join the British Expeditionary Force in France. On 17 April 1917 Robert was promoted to the rank of Lance Corporal with the 56th Battalion. He attended Corps School from 29 May until 22 June, when he rejoined his battalion. Three months later the 56th Battalion was engaged in the Battle of Polygon Wood on the Western Front when Lance Corporal Jones was killed in action, one of three men from the Orange district to be killed in that battle. He has no known grave. 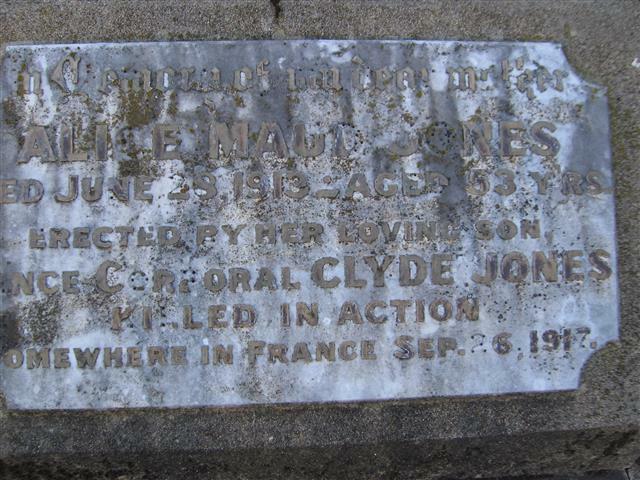 The sad news has been received in Orange of the death of Lance-Corporal Clyde Jones, who was killed in action somewhere in France on the 29th September [sic]. The deceased hero was a native of Orange, and 23 years of age… His only brother, Ted, is at present with the Light Horse in Palestine. Both boys are very well known and highly respected in Orange and district. In May 1918 Robert’s stepbrother Percival received Robert’s personal effects: one testament, one wallet, a purse, his birth certificate, some photographs, a one mark note, and 14 coins. Four years later, on 2 May 1922, Percival completed a statutory declaration to say that Robert had an older brother: Albert Jones of 54 Grosvenor Street in Woollahra, and in July that year Robert’s war medals were issued to Albert. Robert Clyde Jones is commemorated on the Orange East Public School Honour Roll, the World War I Roll of Honour on the southern face of the Orange Cenotaph, on panel 29 of the Ypres (Menin Gate) Memorial in Belgium and on panel number 162 on the Roll of Honour at the Australian War Memorial in Canberra. He is also remembered in Newman Park in Orange, where his name appears on a plaque commemorating former Orange East Public School students who were killed in action and on his mother Alice’s grave in Orange Cemetery, Methodist Section E, Grave 27. In 1923 the Anzac Memorial Avenue of trees was planted along Bathurst Road to commemorate fallen WWI soldiers. A tree was planted in honour of “Pte RC Jones”; it was donated by Eyles and Eyles. Very few of the trees are still standing today. 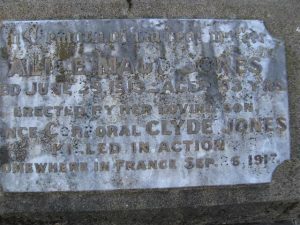 Robert Clyde Jones memorial plaque, Orange Cemetery. 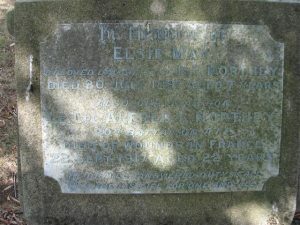 Image courtesy Orange Cemetery. 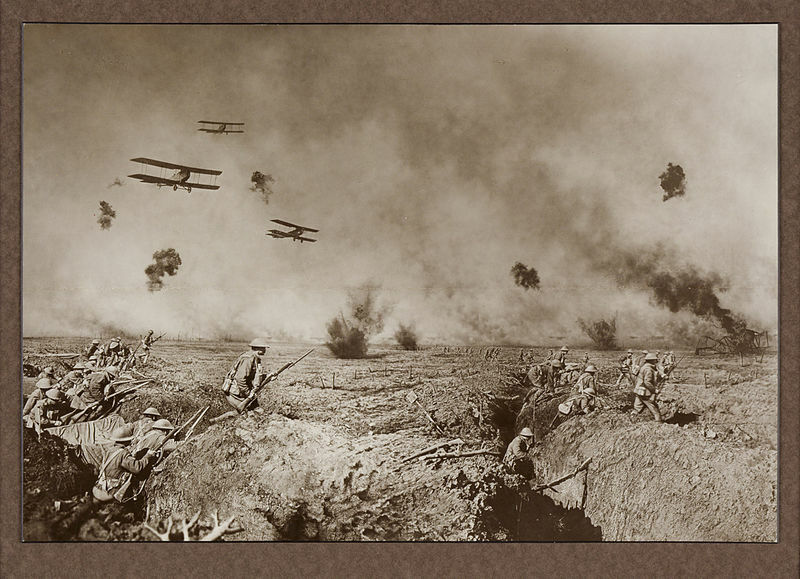 Composite photograph of Australian soldiers during the Battle of Polygon Wood, Frank Hurley. Image courtesy State Library of New South Wales. The Battle of Polygon Wood began at 5.50 am on 26 September 1917 when Allied forces launch a massive artillery barrage on German lines at Polygon Wood near Ypres in Belgium on the Western Front. 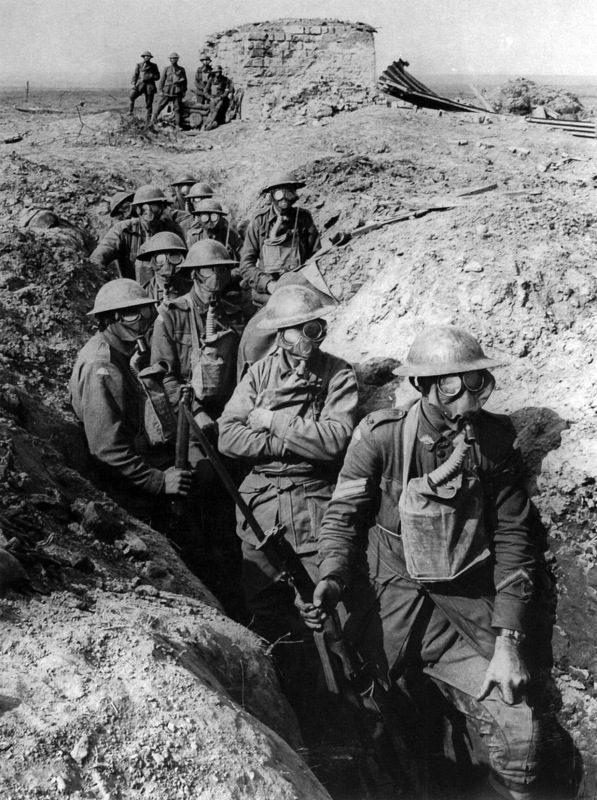 The Australian 4th and 5th Divisions and five British divisions proceeded to attack along a ten kilometre front. A second artillery barrage followed at 7.30 am and by 8 am the Australians had gained a few hundred metres’ ground beyond Polygon Wood. Subsequent German counter attacks made little impact and the battle was declared a great success for the AIF. The attack inflicted a severe blow on the German 4th Army, causing more than 30,000 casualties. The Australian 4th Division sustained 1,717 casualties; the more heavily engaged Australian 5th Division suffered 5,471. Official Australian war correspondent CEW (Charles) Bean described the victory as a “clean, strong blow” attributed to the “most perfect barrage that had ever protected Australian troops” rolling ahead of them like a “Gippsland bushfire”. Allied forces had captured a significant portion of the Flandern I-Stellung and were now in a position to contest the German hold on Broodseinde Ridge. Soldiers of the 45th Battalion wearing gas respirators during the Battle of Polygon Wood, Frank Hurley 27 September 1917. Image courtesy Australian War Memorial. At 5.50am Allied forces launch a massive artillery barrage on German lines at Polygon Wood near Ypres in Belgium on the Western Front, heralding the beginning of the Battle of Polygon Wood. Stanley Michael Jordan enlists. Stanley is commemorated on the Centenary of WWI in Orange Honour Roll; he would die of wounds in France on 29 October 1918. 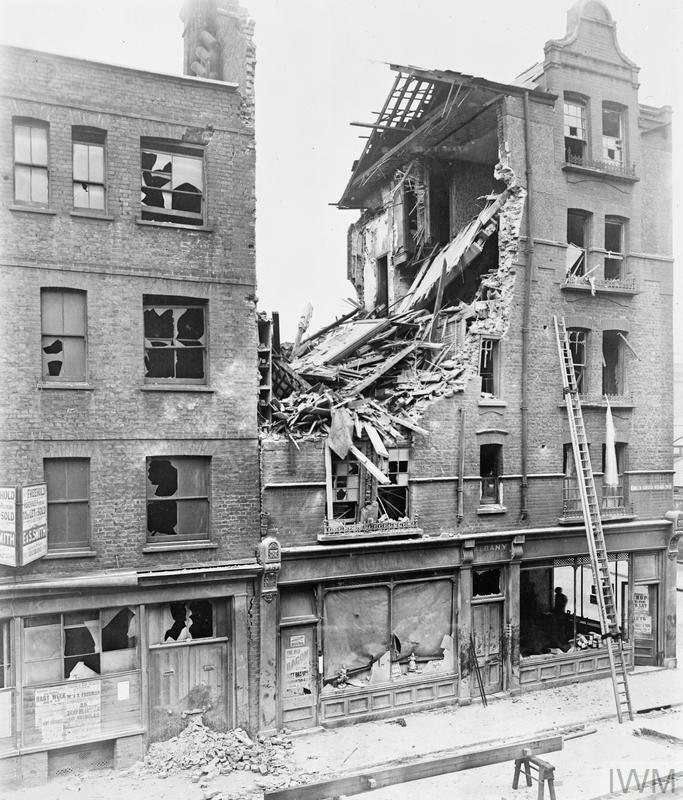 Bomb damage in London following the Gotha raid on the night of 24 September 1917. Image courtesy Imperial War Museum © IWM (HO 72). Every sister of a soldier should make it her business to see that she sends at least one man into military training, for by so doing she is helping her country.